River Plate fans clashed with riot police in Buenos Aires as celebrations to mark their Copa Libertadores win over Boca Juniors got out of hand in the early hours of Monday. 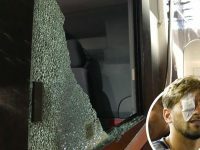 River Plate fans attacked the Boca Juniors team bus before the second leg of the Copa Libertadores final on Saturday, leaving several players injured. Santos' Copa Libertadores match with Independiente on Tuesday night was abandoned after the Brazilian club's fans wreaked havoc. Peñarol and Palmeiras fans clashed in the stands after the final whistle of their Copa Libertadores match on Wednesday night.